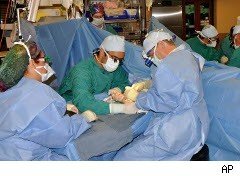 A leading manufacturer of artificial hips and knees agreed to pay the state of Massachusetts $1.35 million to resolve allegations that it marketed orthopedic devices without regulatory approval and, to boost sales, withheld patient safety information from health care providers. A complaint filed earlier this month by Massachusetts Attorney General Martha Oakley accused Stryker Biotech, a unit of the Stryker Corporation, of falsifying hospital review documents, subverting clinical review procedures, promoting the use of medical devices not approved by the FDA, and misleading physicians about appropriate use of its products. The products in question are used by surgeons to strengthen the growth of bones that fail to heal properly, such as broken shin or thigh bones. "Stryker Biotech subverted review procedures designed to safeguard patients and promoted uses of its products that were not shown to be safe or effective," Coakley said in a statement. She also characterized the company as "compromising patient safety in pursuit of profits." Under the terms of the agreement, Stryker will pay $325,000 in civil penalties, $875,000 to fund efforts to combat unlawful marketing and other programs, and $150,000 to cover costs of the three-year investigation. The investigation focused on the Michigan-based company's marketing of the OP-1 Implant and OP-1 Putty. The OP-1 products were granted limited approval by the FDA for use in patients only after more conventional methods failed, were impossible, or after a hospital's internal review board sanctioned their use. Stryker promoted treatments beyond the limits set by the FDA, however, going so far as to forge hospital documentation, according to the complaint. Sales flourished, the state says, because the company encouraged its representatives to push the products to surgeons and hospital staff without disclosing restrictions. The company reported 2009 revenue of $6.72 billion. The orthopedic joint replacement market is highly competitive due to demand driven by an aging population, an increasing number of younger patients in need of procedures, and improved implant materials and surgical techniques. This is not the first time Stryker has been accused of bypassing regulations. Last year, two former sales representatives pleaded guilty to charges that they championed off-label uses of human bone growth products, even though they knew of adverse reactions in some patients. A few months later, former Stryker president Mark Philip was indicted by a federal grand jury for misleading the FDA about uses of the products, though he pleaded not guilty. The company admitted no wrongdoing in this settlement, the latest in a series of court actions initiated by the Attorney General's office in response to unfair and deceptive trade practices by pharmaceutical companies and health insurers.